If the diet is inadequate then a good supplement is absolutely important to the maintenance of a healthy body and healthy looking hair, skin and nails. 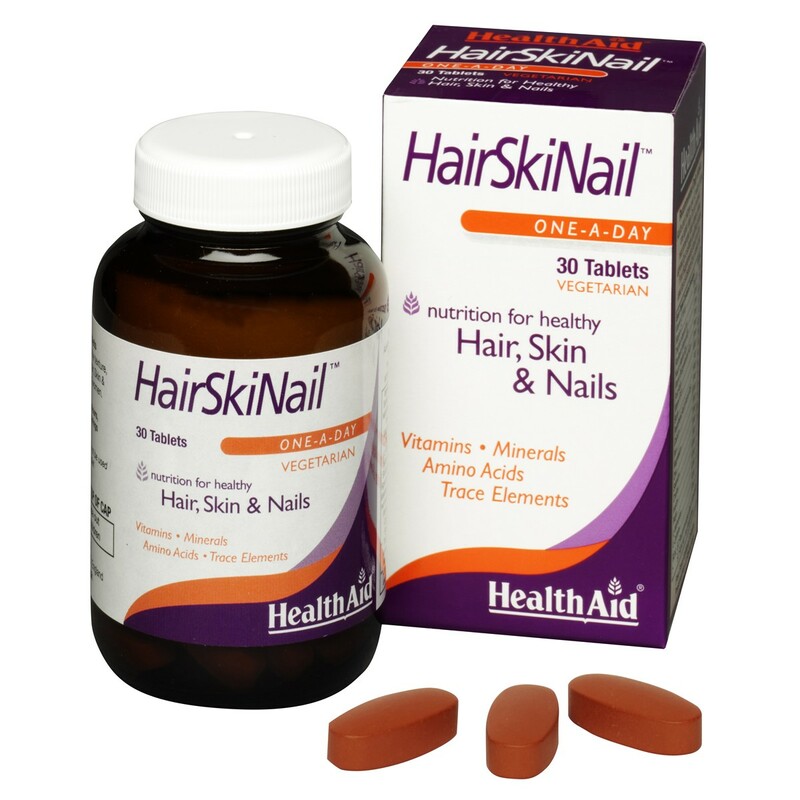 Hair Skin Nail has been formulated using vitamins, minerals and important amino acids that are metabolised to provide nutrients to these specific areas as well as maintaining the digestive system and proper blood circulation. Hair Skin Nail is not only a supplement for hair, skin and nails, the B vitamins promote digestion and metabolism, vitamin E helps with poor circulation and hormonal imbalance, and the selected amino acids not only having strong antioxidant properties but also are good liver protectors and detoxifiers, these factors all contribute to poor hair skin and nails. - Helps safeguard essential nutrients in the diet. Calcium Carbonate, Choline Bitartrate, Maltodextrin, Magnesium Oxide, Para Amino Benzoic Acid (PABA), Inositol, L-Cysteine, Vitamin C (ascorbic acid), Microcrystalline Cellulose, L-Methionine, Ferrous Fumarate**, Seppifilm (methylhydroxpropyl cellulose, microcrystalline cellulose, acetylated mono-and di-glycerides), Pyridoxine HCI (vitamin B6)***, Zinc Oxide, Calcium D-Pantothenate, Gum Acacia, Nicotinamide, Veg. Stearic Acid, Silicon Dioxide, Sepisperse Dry Red (titanium dioxide & red iron oxide colours), Thiamin mononitrate (vitamin B1), Natural Vitamin E (d-alpha Tocopherol), Riboflavin, Veg. Magnesium Stearate, Folic Acid, Copper Sulphate, D-biotin, Manganese Sulphate, Sodium Selenite, Vitamin B12 (cyanocobalamin). Adults and children over 12 years of age, one tablet daily. Do not exceed recommended daily intake unless advised by a suitably qualified person.Food Supplements should not be used as a substitute for a varied diet. This product contains iron which if taken in excess may be harmful to very young children.Long term intake may lead to mild tingling and numbness. Thank you for your interest in HealthAid Hair, Skin & Nail Formula. Enter your email and we'll contact you as soon as it's available again.